Planning for buying a new reel? We have a suggestion. Penn Fathom Lever Drag Reel would be your new ocean-mate for a long time from this season. At present people are interested in fishing not only for food purpose but for passing their time. No matter if you are fishing as a professional or just a hobbyist, a perfect fishing reel is a must have item. Especially if you are aiming to haunt pelagic fish, your reel must have some unique features. While choosing a spinning reel, consideration comes first about which fishing activities your reel is perfect for. In that angle, Penn Fathom Reels are packed with all necessary characteristics. These are capable of fulfilling all requirements for broad-range fishing activities. Here, our Penn Fathom Lever Drag Review will represent a brief regarding this. Read it thoroughly to get a proper idea. Fathom LD reels are featured with full metal body and side plates. These are wisely engineered with a die-cast aluminum frame and side-plates providing extreme strength with reduced weight. Penn’s unique Dura-Drag material is used in their Fathom LD reels. It contains a unique Phenolic bonding agent that provides a barrier to water. Thus the reel is corrosion resistant and safe from the premature breakdown of its carbon fiber material. Each drag washer is specially pretreated with a compound developed by PENN engineers that ensure smooth performance of the drag. They are same in bearing numbers (5) and are different in their gear-ratio, size, line-capacity or weight. All are lightweight reels, with the weight range from 15.10 oz (for the size 15LD) to 24.7 oz (for the size 40NLDHS). All models of Fathom family are easy to cast and comfortable to handle. The primary and the pinion gears are made of stainless steel and resistant to corrosion. This feature ensures optimum smoothness as well as toughness and durability of the device. Also, check out our pick for the best spinning reel available on the market. Some questions and answers, commonly asked by customers, are listed here. It can help you to make some confusion that may arise in you. Q-1: Can I use it to catch 50 lbs tuna? A-1: Yes, you can use this reel easily to catch 30 to 80 lb grouper. It is a solid and durable fishing reel. 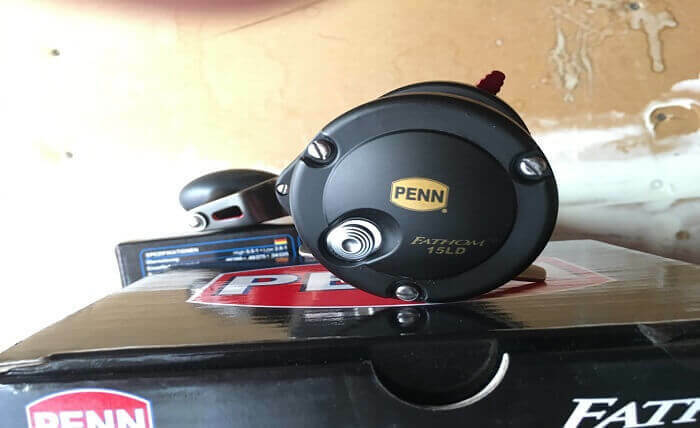 Q-2: Are the Penn Fathom LD reels suitable for bottom fishing? A-2: Of course they are! Penn Fathom reels can cover a broad range of fisheries application such as bottom fishing, jigging or live to bait. Q-3: How can I distinguish the single-speed model from the two-speed? A-4: “N” represents Narrow Spool. While looking for the perfect reels, you should look for reliability and value in it. You can find the Penn Fathom Lever Drag (LD) Reels as an excellent representation of both. Besides, the fantastic outlook adds an extra dimension to its overall value. The right gear ratio and smooth finished stainless steel bearings made these reels the fastest “stock” reels on the market. Regardless the size, the blazing speed would turn it into a perfect choice where the maximum speed is paramount. Fathom LD Reel has a surprising extent of pulling power and can be a somewhat specific item for you. Hope this Penn Fathom Lever Drag (LD) Reel Review will serve you with proper information to take the right decision.